Hundreds of perfume bottles stacked on shelves in the laboratory of Fragonard Parfumeur in Grasse in Provence, France. Photo of bottles in the laboratory used in the making of perfume at the Fragonard Parfumeur in Grasse, Provence in France. ... There is over 3000 years of perfume making history in this historic factory and it is located in the center of the Old Town of Grasse, Provence. 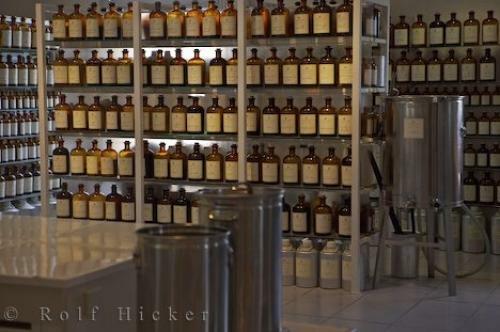 The factory, boutique, museums are just a few of the fascinating places to see while at the Fragonard Parfumeur which is open daily for tours.Fragonard Parfumeur, Perfumery laboratory in the town of Grasse, Provence, France, Europe.